Just a little bit ago, something caught my attention out of the corner of my eye. When I’m sitting here on the couch working on this laptop, I’m facing the living room wall and the front door. The patio doors are to my left side in the dining room. So when there’s something moving out on the patio, I will often see the movement and turn to see what it is. 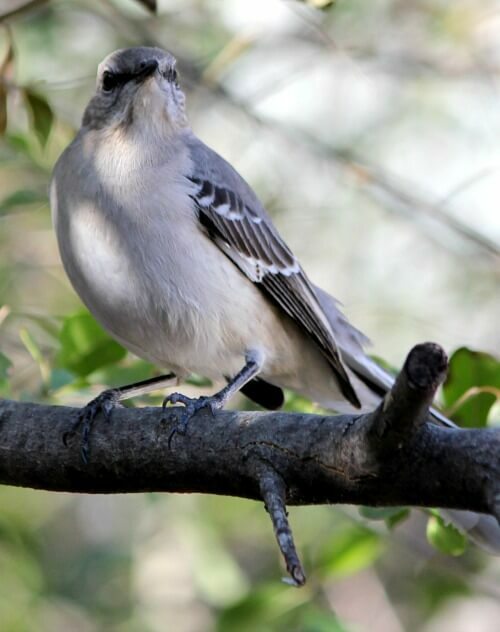 I looked up and saw a mockingbird out there. 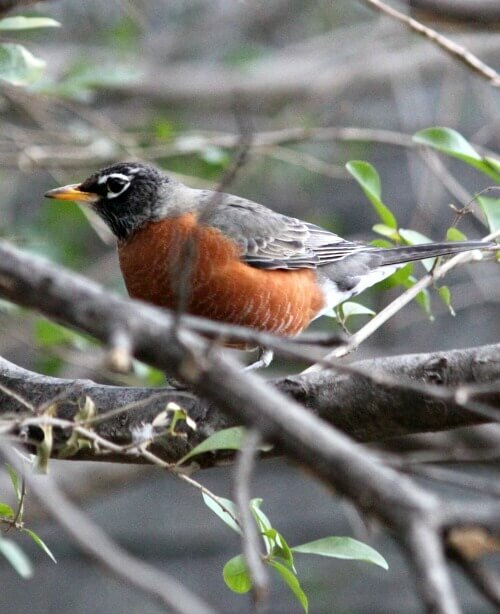 Then before I could even get up with my camera, it was replaced with about a dozen robins. The robins all quickly flew away together and were replaced with another flock of birds. I could not get a good photo, even though I was by then in front of the patio door. For the life of me I can’t recall the name of these birds, though I know I’ve written about them before. I recall a mass exodus of them in Texas once that I captured with my camera. I wasn’t as lucky here, but I got a few shots where you might be able to identify what kind of birds they are. I will think about this all day, so if you recognize this bird, please tell me what they are. They all took off then and headed to a distant tree. I got a photo, but the sky is overcast and they are too far away to be able to see them well, though I zoomed in as much as I could. I wonder what this means in the laws of nature that these various types of birds are coming in in flocks all of a sudden, when there hasn’t been a lot going on for the last month or so? Does anyone know if this precedes weather or seasonal changes? Aside from trying to photograph birds, which is customary, I did get some chores done this week. I cleaned out one of my two walk-in closets. It’s basically my only place for storage for decor. So when I switch something out, I typically don’t take the time to find a good place for it. I just open the door, scoot it in, and say I’ll worry about it later. I always feel so much better when I can cross a big chore off my list. Then the other day I borrowed the leaf blower from my neighbor (it’s actually mine and I gave it to him because he has outdoor storage and I don’t) and got out on the patio and cleaned it up. I really hadn’t done a good cleaning out there since the trees came down a few months ago. So it was surely due. Took me hours, but I was glad to have that chore done too. Now when I get a chance and the weather is nice again, I need to get out there and cut back the dead plants. Probably should have done that first, but I didn’t. Things were pretty for so long this year that I haven’t cleaned up the pots yet. I certainly appreciate all the feedback I got from you all about what kind of posts you want to read. I have already started adding small home tours back to the blog, which some of you said you enjoyed. Next in small space living I’ll have a post about a couple living in a less than 200 square foot vintage Airstream. I like to go back and look at these small home tours myself because it’s kind of like looking at a magazine for ideas for my own home. Don’t know if you noticed, but if you scroll down to the bottom you’ll see that I added small home tours. So they’re easy to locate now. Above the photos you can click for more of those posts. 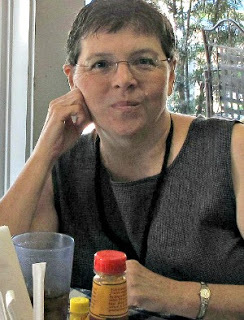 I also added book reviews for easy perusal. Might they be cedar waxwings? The cedar waxwings fly through in a flock here in Wis. and feast on crabapple trees in October here. They strip the trees and then they’re gone after a day or two. They have a crest similar to blue jays and cardinals. Maybe you have some fruit/berry trees and/or bushes they enjoy? I see you have received the answer to the birds’ idenity, but I wanted to say thanks for the easy-to-access tabs for the books review, and the addition of small house living. I enjoy those, and it’s so much easier than scrolling through many posts to locate. Have a great day! I, too, agree with Waxwing. One day I was walking home on the former rail line, now part of the across Canada walking trail, and came to an old apple tree filled with these birds. It was the first time I had ever seen them, so I looked them up as soon as I reached home. I love the variety of birds you see on your patio. We downsized a few years ago, now the main birds I get at the feeder are crows, blue jays and mourning doves…….and an odd seagull!! Perhaps you have a storm coming…..? I’ve been waiting for our weather to clear so I can get out and trim back the rose bushes. But, we’ve had rain….and rain….and then some rain. Well, it’s Oregon–rain happens. I’m enjoying the variety of your posts lately. Cedar waxwings are so pretty aren’t they? My mom saw a flock of them years ago down here in Florida . Flocks of starlings have been coming through southwest Milwaukee County, WI for about a month already, which is unusually early. My guess is that the weather where they winter-over got warm early and they headed back north. We still have February and March to get through though, and we haven’t really had a blizzard yet this season. We can get horrid weather in those 2 months here, tons of snow and cold. But for now, it seems the Polar Vortex has dissapated. Today the snow is melting and it’s sunny but winds are strong, gusting up to 35 mph. We did have 2 January thaws this year, very unusual. I hope this spring is not like last season. It started warming up a lot in February and some of my perennials started coming up – WAY too early! I was in a panic. Of course we had nasty freezes return and snow, but fortunately, it didn’t seem that I’d suffered any damaged to my early-bird flowers! Squirrels are mating already, that is always a sign of an early spring. 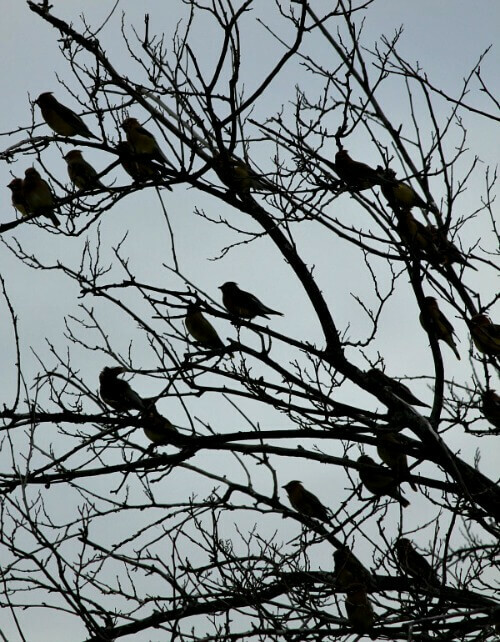 How lucky you were to see a flock of cedar waxwings! I love those birds. One year a pair built a nest in a small tree outside my kitchen window and I watched the babies hatch, grow and eventually fly away. Your pictures brought back some great memories. As usual, your photos are great. 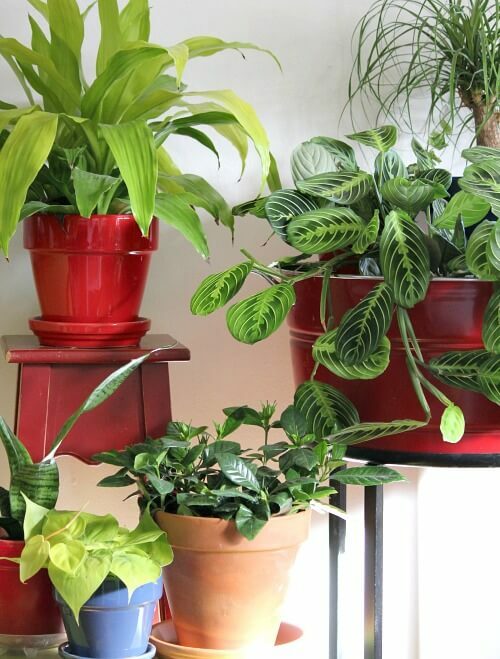 The birds look so close and your houseplants look so green and healthy. I will be paying more attention to my houseplants as a result of seeing how pretty yours look. I cleaned out the cupboard in my laundry room this week (this chore was long overdue); uncovered a few Christmas presents I had been unable to find and mailed them this week. Guess I should’ve caught the cleaning “bug” in early December! The clean up of the walk in closets are next on the chore list. Ugh! I know that I will be happy to check this off my list. Take care and have a wonderful Friday! If you posted pictures of small apartments I didn’t find them. I too enjoy looking at the small places and the many ways they are decorated and the ingenuity of making it all work. They are Cedar Waxwings. I have only seen them once in Indiana. A flock landed on a bush in our yard that had berries on it and they ate for a time and then moved on which made me believe they were migrating. I have never seen them again. But it was thrilling to see them. 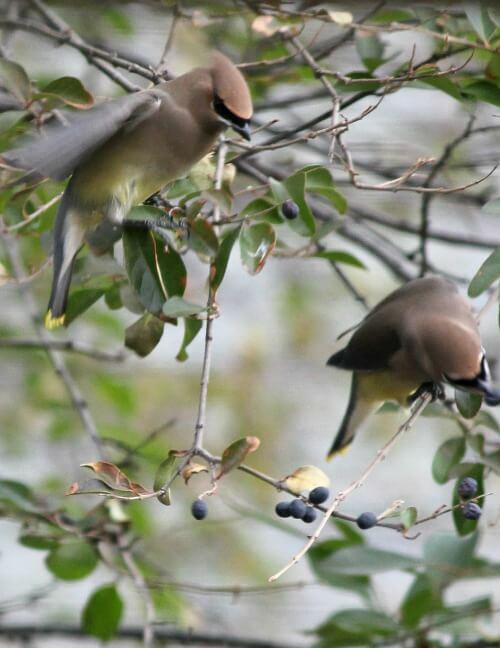 I always lived the one day a year the cedar waxwings would strip the crab apples of berries. Lovely sight! And a huge flock of robins came through about this time to strip holly berries and their noise was fascinating. We have 3 large hollies here that last winter whend we moved in were loaded with big red berries. Not a one this year and we haven’t done any pruning. Isn’t that strange? I love your blog. I live in Troup TX. It is close to Tyler, and I go there to shop and to the doctor. I am dying to figure out where you used to live. I keep looking for a two story that backs up to a burger place ! If your ex doesn’t live there anymore, would you be willing to send me the address. I might be a safer drive if I could quit looking for your house ! I love your blog. I live in Troup TX. It is close to Tyler, and I go there to shop and to the doctor. I am dying to figure out where you used to live. I keep looking for a two story that backs up to a burger place ! If your ex doesn’t live there anymore, would you be willing to send me the address ? I might be a safer drive if I could quit looking for your house ! Hi there. My husband said those birds are cedar waxwings, just as others have said. He knows birds much better than I do so I showed him the photo. 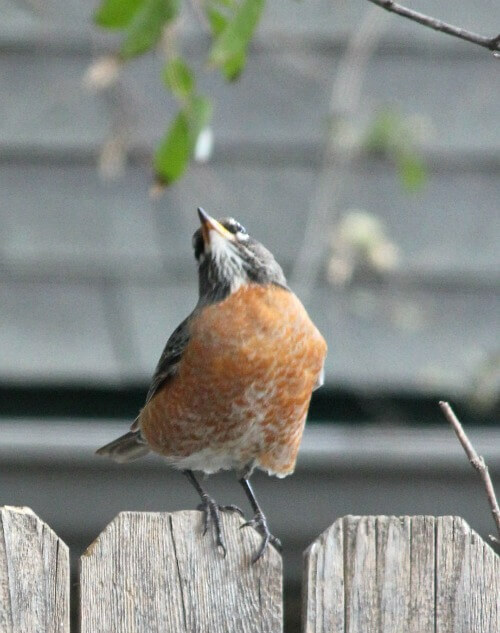 He’s of the opinion that the robins and cedar waxwings are birds who like to be in flocks and they are out looking for a meal so that’s why they visited you the way they did — just hoping to find something to eat! In the close-up photo of the cedar waxwings they are eating privet berries. You get some wonderful photos of wildlife on your little patio, and I’d say that all of your vegetation makes it look like a safe and tempting place. I don’t cut things back in the fall but wait until a nice day in late February or early March. I figure the plant growth can provide a bit of shelter to a little critter, and, the snow looks pretty on top of the dead plants. Great post!